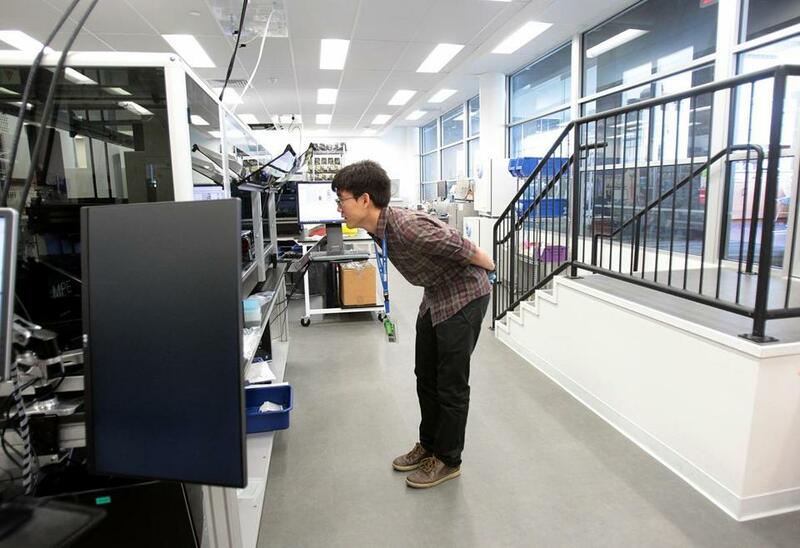 David Gonzeles inspected products at Ginkgo Bioworks, a Massachusetts Institute of Technology spinoff operating out of South Boston. The company is developing a roster of “bio-products” that include organic pesticides. When a senior executive from drug giant Bayer AG visited Boston last month, he wanted to talk not about biotechnology, but bio-agriculture, a growing field focused on the use of gene science and organic materials in farming and food production. Among the stops made by Adrian Percy, head of research and development for Bayer Crop Science, was Flagship Ventures, a Cambridge firm that is investing part of its new fund in bio-agriculture. Bayer’s big bio-ag business — it accounts for nearly a quarter of the German company’s $45 billion in annual revenue — is unusual in the pharmaceutical business. Even though gene editing and the microbiome have applications in both the human and plant worlds, companies typically focus on one or the other, not both. The same is true for investors that help startup companies get off the ground. Venture capitalists in the Boston area have long focused on biotech drug development, which is natural, given that the region is a global life-sciences hub. Their reasons for avoiding bio-agriculture range from lack of expertise to a continued public resistance to bioengineered foods, notably in Europe, that makes it difficult to gauge demand and scale businesses. But a few local firms, notably Flagship and Boston-based Polaris Partners, have been putting money into companies in bio-agriculture areas such as creating hardier crops and improving farm yields. Such investments, and outlays from out-of-state venture firms, are helping support a fledgling bio-ag cluster in Boston. Flagship is making bets on everything from enabling technologies to bioinformatics with agricultural applications. Flagship has invested in Indigo Agriculture Inc., a Charlestown startup that is working on engineering water-efficient crops. The company last week said it had raised a fresh round of $100 million in financing, bringing the total to more than $150 million. Another startup, Cibo Technologies, was hatched by Flagship VentureLabs in Cambridge, the venture firm’s in-house incubator.Cibo has yet to be publicly launched, but it is working on ways to boost the efficiency of farming while reducing its environmental impact. “We need to grow more food because of climate change, and we need to be more efficient,” Martinez said. Flagship is scouting for other investments. Polaris has made four investments in bio-ag dating back to 1998, but its only current portfolio company is AgBiome Inc., based in North Carolina’s Research Triangle Park, which is developing products that reduce farming risk and improve crop yields. The company was started by “repeat entrepreneurs” that succeeded at earlier Polaris bio-ag companies, said Amir Nashat, the firm’s managing partner who has worked with the bio-ag startups. “Lenders have to be very careful about entering this industry,” Nashat conceded. “It seems like an adjacent field because the technology is tantalizingly similar. But to be successful, you really have to understand that the businesses and the markets are very different. It takes time for players to realize what technologies will make it over” from biotech to agriculture. A small cluster of bio-ag startups, or companies that make enabling technology, has taken root in the Boston area. Five are housed in Greentown Labs, a Somerville incubator best known for clean tech. Among them are Grove Labs — a 20-person company that builds aquaponic systems, complete with LED lighting, for growing fruit, vegetables, and herbs at home — and Raptor Maps Inc., which makes drone-empowered analytics to collect data for optimizing crop development. “There’s a lot of opportunity for more efficient use of resources in agriculture,” said Greentown Labs chief executive Emily Reichert. Ginkgo Bioworks, a Massachusetts Institute of Technology spinoff operating out of South Boston, is developing a roster of “bio-products” that include organic pesticides. The company recently struck a partnership with industrial bioproducts giant Amyris Inc. of Emeryville, Calif., to jointly develop, produce, and commercialize more than 70 products based on engineered microbes for the industrial, health, and personal care markets. They range from industrial lubricants and jet fuel to fragrances and nutritional ingredients. Ginkgo recently raised $100 million in funding, from West Coast and New York investors. Kelly said he has talked with Boston investors, but thinks they are still “being myopic” about bio-ag. Bayer’s Percy says that because Greater Boston is a hub for biopharma innovation, he sees bi-ag as a natural extension for the area’s fast-growing life-sciences industry. “Even if the Boston area isn’t known for agriculture, there are so many things going on here that apply to agriculture that we feel like we have to have a presence here,” Percy said. Bayer spends about $1.1 billion a year on ag-related research and development. Its crop science business, with $11 billion in annual revenue, would grow substantially if the company succeeds in its $62 billion takeover bid for Monsanto Co., the world’s largest seed company. Monsanto, based outside St. Louis, initially rejected the offer. The two companies are negotiating. A deal, if it occurs, might prompt other large drug companies to seek their own footprints in bio-agriculture and spur more cross-pollination between the fields. Among the areas ripe to develop as adjacent sectors is digital agriculture, farming technologies that let growers better monitor where different crops are planted in their fields, gauge the depth and spacing of seeds, and identify when and where to apply fertilizers. “There’s more technology in the modern tractor than there was in the first lunar landing craft,” Percy said. But he added that there’s still room for plenty more. “The goal is to let farmers maximize the yield of the fields,” he said.